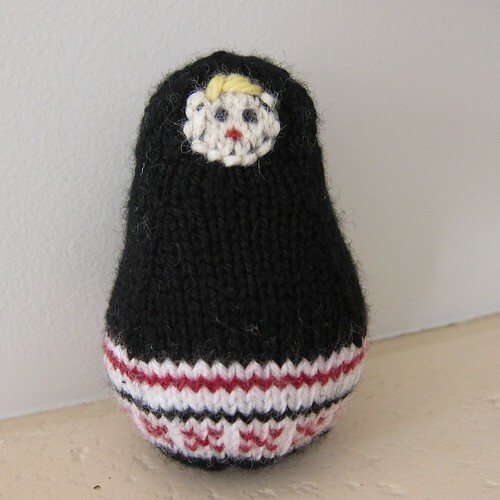 I took inspiration from the Russian team uniforms for the simple colorwork pattern on the doll. You can see the lines of stripes and crosses up the front of the sweaters. I had originally read they were black and burgundy, but obviously they are blue, so my colors are slightly off. 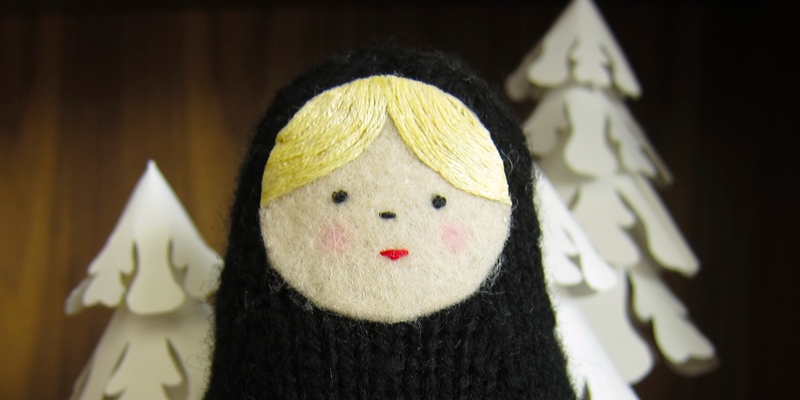 Originally, I had planned to knit the face and just embroider the features. Oh man, was it ever awful. 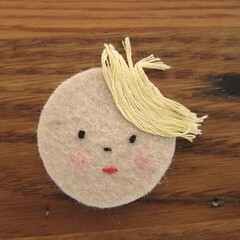 That took me back to the drawing board and I ended up going with a felt face that I embroidered before glueing on. A huge improvement! Worsted weight yarn in three colors. You really just use scrap amounts here. Gauge is not super important here you will just get a bigger or smaller doll, this doll is 4 inches tall. Just make sure the gauge is rather tight so you won’t see the stuffing though your knitting. Ssk – Slip the first two stitches off the left needle onto the right needle as if to knit. Insert the left needle into the front of these two stitches & knit them together. Cast on 6 stitches. Divide between 3 needles. Join together being careful not to twist. 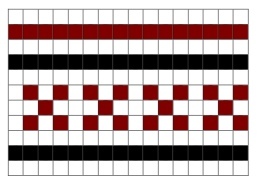 Place a marker between your first & last stitch to mark rows. Pull your cast on tail inside and weave it in. Also start stuffing the body, stuff it pretty tight to get the shape you want. 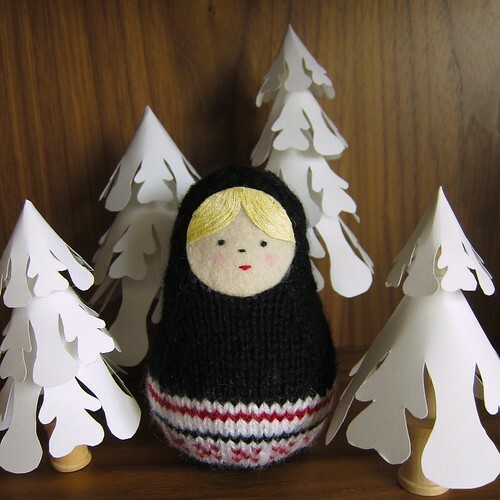 If you want to weigh down the bottom of the doll so it will stand easier, add a rock or some other weight to the bottom before stuffing. Finish stuffing the body if needed and stuff the head as much as you can. 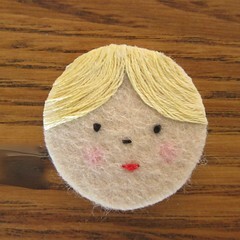 Cut an appropriate sized circle from the felt for the face. I used a spool of thread to draw mine. Embroider on eyes, nose and mouth. I did single French knots for the eyes, a small straight stitch for the nose and three straight stitches for the mouth. Color small circles with the pink colored pencil for the cheeks. For the hair, draw guidelines with pencil where you want the hair to be. Fill that area in carefully with glue. 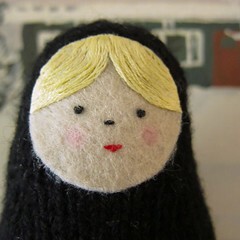 Lay pieces of embroidery floss slightly longer than the face across the glue in the direction you want the hair to go. A straight pin is handy to help move the floss into place. Let dry and trim the hair to the edge of the face. Add a little extra glue at the edges if you need it. Do not duplicate for distribution, teach, claim as your own or repost this pattern without permission. 5 years ago by Kat in Challenges , Embroidery , Iron Craft , Knitting , Knitting Projects , Needlecraft , Projects | You can follow any responses to this entry through the RSS feed. You can leave a response, or trackback from your own site. Oh, I love that! The felt face is darling. Thank you, much better than the original knit one for sure! I am always amazed with your projects. Another beautiful keepsake. I also appreciate your tableau with the paper trees. Nicely done all around. Thanks, I thought the trees made for a nice background here since I still had them up.